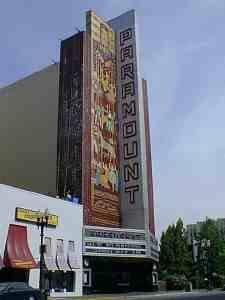 This is a superior rendering of the "Art Deco" or "Moderne" style of movie palace. 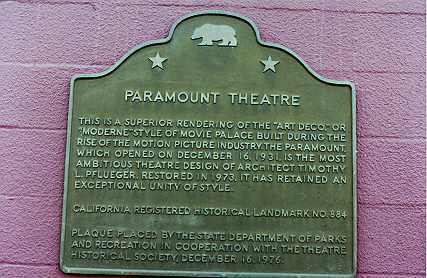 Built during the rise of the motion picture industry, the Paramount, which opened on December 16, 1931, is the most ambitious theatre design of architect Timothy L. Pflueger. Restored in 1973, it has retained an exceptional unity of style. 2025 Broadway, Oakland; plaque located at 475 21st St.
Return to other landmarks in Alameda county.